The following summary of planned new and ongoing road improvements over the coming week is correct as of Friday, March 6 and could be subject to change due to weather conditions or unforeseen circumstances. All improvement work is carried out by the Highways Agency with the aim of causing as little disruption as possible. Work is taking place to repair two bridges, which carry Congleton Road and Betchton Road over the M6. Lane closures and a 50mph limit will be in place along sections of the M6 while the work is taking place. The scheme is due to be completed by May. A major project is being carried out to reduce congestion and allow for faster journey times through junction 17 of the M6, including building a new roundabout and a new link road from the A534 to the M6. Work is taking place overnight between 8pm and 5am during the week, and until 7am at weekends. Some lane closures will also be in place, along with a 40mph speed limit on the A534. The project is due to be completed in March. A major project is taking place at Orrell Interchange, which will see extra lanes and traffic lights added to the junction with the M58 and the A577. The majority of the work is taking place overnight or at weekends. The scheme is due to be completed by the end of March. A project is being carried out to reduce congestion around the motorway junction which connects the M6 to the Blackpool-bound M55. There will be narrow lanes, plus some overnight slip road and carriageway closures until the project is completed by the end of March. The northbound side of the M6 is due to be closed overnight between junctions 31 and 32 on Wednesday 11 and Thursday 12 March. The eastbound exit slip road from the M55 onto the M6 is due to be closed overnight on Friday 13 and Sunday 15 March. The northbound section of the M6 past junction 32 is due to be closed overnight on Tuesday 10 and Saturday 14 March. The closures will take place between 9pm and 6am, and diversions will be in place. A scheme is taking place to install four electronic message signs and CCTV cameras near junction 35 of the M6. Lane one of the motorway will be closed during the work, and lane two will also be closed overnight towards the end of the project. The new signs and cameras are due to be switched on by the end of March. A project is taking place to upgrade the section of the M53 at junction 2, removing weight restrictions and reinstating lanes. The southbound exit and entry slip roads will close to all traffic during the scheme. The northbound slip roads will also need to be closed overnight at times and there will be at least two full weekend closures of the main motorway carriageway to allow the bridges to be removed and replaced safely. A 50mph speed limit and narrow lanes will be in place. A project is underway to add an extra lane to the eastbound side of the M56 at junction 7 to ease the flow of traffic onto the motorway. Narrow lanes and a 50mph speed limit are in place while the work is being carried out. Some overnight closures of lanes and the eastbound carriageway will also be required during the scheme. It is due to be completed in March. A major project is taking place to tackle congestion at junction 11 of the M56 near Daresbury. Clearly signed diversions will be in place when roads are closed. The project is due to be completed by the end of March. A major scheme is taking place to cut congestion and improve journey times on parts of the M60 and the M62 in Greater Manchester. The scheme will require some overnight closures affecting the full carriageway and slip roads, with a 50mph limit in place for the safety of workers and drivers. The project is due to be completed in Autumn 2017. A project is taking place to replace lane markings and reflective road studs along sections of the M65. The lighting at the junction 8 slip roads and roundabout is also being repaired, and the project is due to be completed by the end of March. A project is taking place to tackle congestion at junction 5 of the M65 by installing of traffic lights at the roundabout and improving the layout of the junction. The majority of the work will take place between 9.30am and 3.30pm during weekdays, and between 10pm and 5am at weekends. Some lane closures and the eventual full closure of the roundabout, including the approach roads, will be required and publicised in advance. The project is due to be completed in March. Drivers travelling between Chester and Wrexham are being urged to avoid the roundabout that links the A55 to the A483 while work takes place to upgrade the junction. There are currently lane closures on the roundabout, which are causing significant delays. Drivers travelling to and from the southern part of Chester are being encouraged to use the A534 and the A41 while the lane closures are in place. 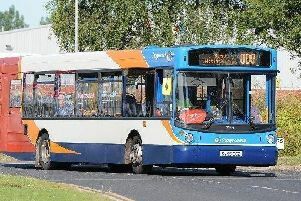 Drivers heading to and from the northern part of the city can use the A550, A55, A494 and M56 as an alternative route. The scheme is due to be completed in May. A £192 million project is being carried out to create a new dual carriageway linking the M56 to the M6 in Cheshire. A mile-long section of the existing A556 will be upgraded from junction 7 of the M56 near Bowdon before breaking away to the west, bypassing the village centres of Bucklow Hill, Mere and Over Tabley. It will then join up with junction 19 of the M6 near Knutsford. A temporary 40mph speed limit is currently in place between Bucklow Hill and Bowdon, and the new dual carriageway is expected to open in Winter 2016/17. A major scheme is taking place to improve the A585 crossroads at Garstang New Road, Fleetwood Road and Windy Harbour near Blackpool. The scheme will involve the realignment and widening of the existing crossroads to create extra lanes through the junction. There will be a compulsory 30mph speed limit along a mile of the A585 and a short section of the A586, with temporary traffic lights in place. Work is expected to be completed in March. A 24-hour lane closure is in place on the westbound side of the A590 while work takes place to install a new electronic message sign. The road will be closed overnight, between 8pm and 5am, on Wednesday 11 and Tuesday 17 March. A diversion will be in place. The scheme is due to be completed by the end of March. The A590 will be closed overnight, from 8pm to 5am, between Park Road roundabout and Askam Road roundabout on Thursday 12 and Wednesday 18 March while work takes place to install a new motorway-style message sign. Diversions will be in place, and drivers travelling to and from Barrow are being encouraged to use the A5087 coastal road instead. The scheme is due to be completed by the end of March. Work is taking place to install traffic lights at the A595 junction with Mirehouse Road in Whitehaven. Temporary traffic lights will be in use between 9.30am and 3.30pm while the work is carried out, and the project is due to be completed by the end of March. A new road is being built through the centre of a roundabout near Liverpool Docks to ease congestion in the area. The two lane westbound road will mean traffic heading towards the docks on the A5036 will no longer need to go around the Bridge Road roundabout. Traffic lights are also being installed, and the road is being resurfaced. Lane closures are currently in place leading up to and on the roundabout between 8am and 5pm. The project is due to be completed in March.